Pet owners tend to trust dog food brands that have been around for a long period of time. At one point or another most owners probably fed their puppies and dogs Pedigree dog food. One of the reasons that people tend to gravitate towards this food is because there are many different options for various breeds of dog. They also cater to dogs of various age groups such as puppies, adults, and senior dogs. This means that you will be able to find food to fit your canine, regardless of their stage in life. In addition to providing vouchers to help take some of the financial burden away from buying dog food, we also provide honest reviews. Let’s take a look to see if Pedigree dog food is the right chow for your dog. On this page, you will be able to find a variety of discounts for the Pedigree brand. These have been collected from various websites, and a list has been compiled on this page. If you are looking to save some money on your next bag of Pedigree, you are in the right place. There are several ways that you can have access to these discounts. Once you click on the link, you will be taken to a different website. Here, you will either have the option of a voucher or a direct bargain. You can choose whichever is more suitable for you. For the first half of 2016, there has not been a single Pedigree dog food recall. There have been no announcements made by the FDA regarding the ingredients or the freshness of the kibble. Similarly, there have been no voluntary recalls declared by the parent company either. 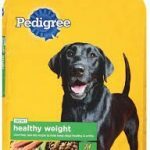 While Pedigree has been under scrutiny in the past regarding the contents of its dog food, there has been no negative publicity recently. In fact, since 2014, the brand has not undergone any food recalls or been given any other health warnings. Pedigree is owned by a subsidiary of Mars Incorporated, known as Mars Petcare. Although it did not acquire the name Pedigree until several decades later, the Mars brand has been in the business of pet food since 1934. There are factories in both the United States and the United Kingdom, although the brand is sold in countries all over the world. Pedigree is one of the highest selling dog food brands in the world. This brand has undoubtedly had a history with pet owners for a long time now. Thus, it is only fair to see if the Pedigree dog food reviews match the legacy of the brand. Pedigree creates a wide range of nutrition for dogs, including kibble, wet food, and dog treats. They cater to large breeds, small breeds, puppies, adult dogs, and senior canines. The brand also offers specialized kibble such as Healthy Joints, Active Nutrition, Healthy Weight, and Sensitive Nutrition. The purpose of this article is to review these types of dog food to see how they perform. The dietary needs of dogs are a little different from humans. The caloric needs also differ from breed to breed. For instance, a small breed dog may need up to 40 calories per pound of body weight. A medium sized or larger dog may require only about 22.5 calories per pound. Regardless of these caloric differences, however, their dietary needs remain the same. For instance, protein is the primary requirement for all dogs. Next on the list is fats, with only a minimal amount of carbohydrates needed. It is not enough to just have a high protein content; the majority of this protein should be derived from real meat. Let’s see how Pedigree dog food ingredients measure up. One of the first ingredients listed in Pedigree dog kibble is corn. Corn is quite a controversial ingredient in dog food. This is because it is a carbohydrate and high on the glycemic index. It is also considered a trigger of certain dog allergies, and has been proven to be highly indigestible by canines. Corn is typically considered to be a filler when used in most dog foods. The next main ingredient is meat and bone meal, as well as animal fat. Most animal meal is considered to be quite high in protein, even higher than most other meat sources. It is a little difficult to determine the exact nutrition value of this particular ingredient as the meat has not been named. The animal fat, too, could be a source of fat which your dog needs. The animal has been unnamed for this ingredient as well. There are a few components in Pedigree that might be cause for concern. Most notably this is the fact that the ingredients are preserved with the use of BHA. This is a synthetic preservative that should not be added to dog food for fear of health risks. This kibble also contains artificial coloring. Overall, the protein content of this dog food is not too bad at 22 percent. Pedigree also contains about 10 percent of fat. The carbohydrate content, however, is a little too high for dogs. Pedigree has attempted to increase the overall nutritional value of the kibble by adding a variety of minerals and vitamins. The final conclusion is certainly a mixed one. This is because many pet owners have been giving their dogs Pedigree to little or no averse outcomes. At the same time, this dog food is not necessarily up to mark in creating a balanced diet for your canine friend. In addition to having a few missing components, the food contains some ingredients that should be excluded. That being said, Pedigree is an incredibly popular brand. What owners appreciate most about this kibble, however, is that it is quite affordable, particularly compared to other brands. Pet owners tend to prefer dog food brands that they can give to their dogs throughout their lives. This way, they do not have to constantly wean their pup onto a different type of kibble. This is why some dog food brands have kibble that specifically caters to puppies. Pedigree is no exception, so it is a good idea to take a look at Pedigree puppy food reviews. For the purpose of this assessment, the review will be conducted on Pedigree Complete Nutrition for Puppies. The first few ingredients in this kibble are ground whole corn, poultry by-product meal, brewers rice, and animal fat. As with the previous kibble that was analyzed, it is far from ideal that the first ingredient is corn. While it has been stated that the meal is poultry, there is a lack of enthusiasm due to the term ‘by-product’. This typically refers to the less desirable parts of an animal carcass collected in a slaughterhouse. The presence of animal fat is a good thing, although it would be better if it were preserved strictly in citric acid rather than alongside the notorious BHA. There are some good ingredients to note as well, nonetheless. First is the inclusion of fish oil, which contains DHA, an important component for dogs. It helps with their skin, fur, and major organs as well. There is also taurine which helps in maintaining a healthy heart. Finally, there are also chelated minerals present, which help the puppy to absorb the proteins better. As your canine friend heads into his or her golden years, you are going to have to change the way that you feed them. This is because once again, your dog is going need a different amount of calories. Due to a lack of movement and activity, you might notice that your senior dog is gaining more weight. This means that they need a lower amount of calories than before. Read the Pedigree senior dog food reviews to discover if it is up to code. Let’s take Pedigree Healthy Weight Complete Nutrition into consideration for this age group. This kibble has been tailored to help dogs maintain their body weight. When considering the content of calories, it is significantly lower than in other type of dog foods – 277 kcal per cup. This is keeping in line with helping dogs sustain a lower weight as they get older. The ingredients, however, are not much different from the puppy or adult kibble. The main components are corn, ground whole grain wheat, poultry by-product meal, and animal fat. The animal fat is once again preserved in both citric acid as well as BHA. There is also artificial coloring used in the kibble. There is also the inclusion of chicken by-product meal. This is better as the meat has been identified. Unfortunately, it is still only the by-products of the chicken, rather than the more nutritional parts of the bird. There have been certain nutrients such as vitamin B that have been included to raise the nutritional level of the food. The final thought to ponder is where to buy Pedigree dog food. This is actually an incredibly easy question to answer as the brand is not only popular, but is also available worldwide. You are bound to find this brand of dog food in almost any grocery store or pet food store that you visit. If it is not available in a store near you, you can also find it online. Most online platforms as well as online pet stores carry this food in varying weights. It is up to you to make the final verdict regarding Pedigree dog food. You should go through all of the information that has been provided for you. This includes the nutritional content as well as the other details. You will then be able to decide if this dog kibble is right for you and your pup.